I rather like the idea of panorama photography, although for this to be done well, we need good equipment and first-rate software. The best results come from professionals who have the skills, time and resources for the task. A couple of years back, I looked at some ways that panoramic images could be produced. In November 2009 I wrote on the subject, combining three texts into one article. To recap, I began with Gigapan images, examined some applications for the Mac and ended with a look at the local Blue Pano site of Danai Chutinaton, currently displaying a number of excellent ways that panaoramas and 360° imaging can be used. On the way I tried the fairly traditional AutoStitch which was $1.99 at that time. This used images that had already been taken and were stored in the Photo Library on the iPhone. A good selection was useful to enable the software to complete a successful stitching of the images. It helped that I had experience of making such wide images using a number of applications, but the results were rather good. Some months later, I had a quick look at Pano which walks a user through the process of making a panorama by aligning the edge of one photograph with the next to be taken, so that we know when to press the "shutter button" Although this app went up in price slightly, it is now down to the original $1.99. I have now found a useful panorama app that takes the alignment concept a stage further and as soon as the iPhone is in the optimum position for the next part of the image, the photograph is taken automatically. After the opening screen, Pano Camera 360 shows a grey screen with a white matrix. 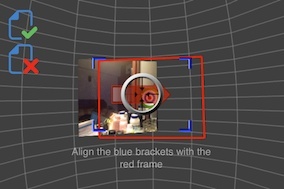 In the centre is a blue thumbnail display of the camera input and a red rectangle for the optimum image. As the two are aligned, the blue changes to green. An on-screen instruction explains this too. For the first image in a sequence, there is a camera icon at the bottom of the screen -- either in portrait or landscape mode. Pressing this starts the process. The coding of the app is smart enough so that we may turn the camera either to left or right, but once the direction is selected, we must continue. As the red aligns with the blue rectangle and then changes to green, the iPhone camera automatically takes the next image in the sequence. With some practice this can produce a panorama (or 360° image) quite quickly, although a problem that even professionals have appeared with ghosting: if a person moves, the stitching of the adjacent images fails to give a sharp picture of the face or body. There are minimum controls: both good and bad. When starting the panorama process with a new image as well as the control rectangles, there are two icons: Lock and a resolution icon, marked 640 by default. This may be changed to 1024 by a tap, but it reverts to the default next time. When the Lock icon is pressed it changes to Auto. It is unclear what this does: I found no difference with either setting. 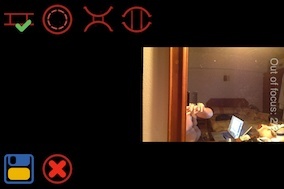 When the user has taken enough photographs (there is no minimum number), there are two choices, clearly marked on the screen: a green tick or a red X (use or discard). Discarding, takes us back to the start screen. Accept processes the image and an example is displayed. If it is wide enough we may scroll left and right. At the top of the screen are four options for type of output: a film strip for a straight image, a circle for surround, an icon for convex images and one for a concave product (looking like the output of a fisheye lens). Two control icons at the bottom are a file image for Save and an X for discard. I tried a number of test runs with this app and the app was certainly easy to use. 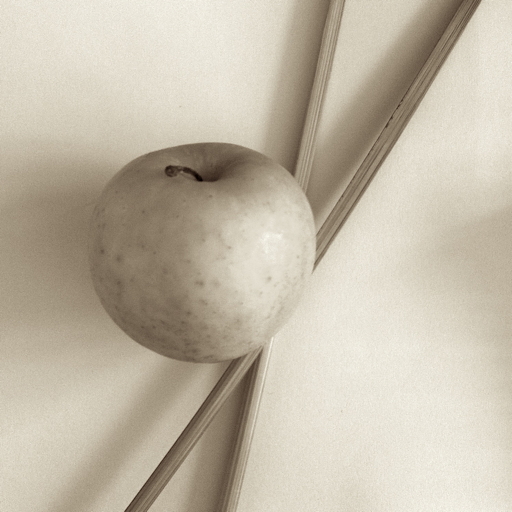 However, the insistence that a photograph was only possible when the app was held parallel to the ground was limiting in some ways, especially with that teasing grid. In a room full of people, when I held the iPhone at face level, I was only able to take an image of heads. I had to hold the iPhone lower down for more of the subjects' bodies to appear. Portrait mode would also be preferable for this type of image. Of course, a panorama is more often taken outside where there is scenery, and it may be better suited to this. Image output varied in size, depending on which mode I used, how many images and the resolution. The maximum (in my brief acquaintance with the app), using only 6 shots, taken with a resolution of 1024 taken in landscape mode is shown as 4324 x 979 (4.2MP) with a file size of 717KB. Exporting that as an 8-bit TIFF image gave me file of some 12.7MB and a picture of 60" x 13.6" which seems a fairly acceptable output from a smartphone and a $0.99 app. Apart from using the basic onscreen settings, it is not possible to make any other changes. As an example, alignment produces a slightly irritating chirp from the iPhone and it would be useful to be able to turn this off. 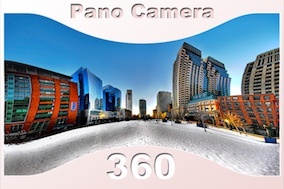 As an inexpensive way to take panorama images -- it is only $0.99 -- this is a nice option, particularly as much of the work is done for the user.